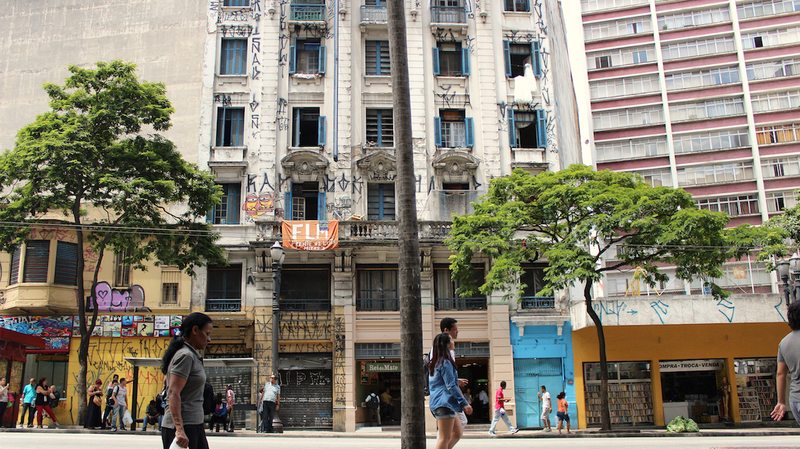 The centre of São Paulo is mainly comprised of commercial, office and abandoned buildings. Most of those who work there cannot afford the rent of the flats downtown, so they must travel everyday from the outskirts, a trip that lasts about two hours. Remember that São Paulo is a city of 17 million inhabitants. Gentrification is usually considered to be the urban movement that happens when an area inhabited by people on low income, is “discovered” by the middle class. But it can also happen when properties increase in their virtual value through real estate speculation; this is mostly the case in São Paulo, the owners leave their properties empty, hoping its value will rise by itself. The neighborhood is soon seen as a point of economic potential and new establishments appear seeking to fulfill the needs of this new wave of people. The cost of living tends to increase and become impractical for the initial residents, who then find themselves impelled to seek new homes, usually in peripheral areas of the city. The housing market plays a central role in this movement. Price appreciation of property rental is the main reason for the migration of low-income residents to the outskirts. So how to proceed if the population can neither afford to pay the high property values nor want to live in remote areas, usually with less access and infrastructure? There are some attitudes that seek to fight back against gentrification, but none, in my opinion are as effective and immediate as the Brazilian Autonomous Housing Movement. Hotel Columbia Palace, occupied since 2010, it is located in downtown’s famous corner, São João x Ipiranga. The FLM – Front in the Struggle for Housing, is a movement, created in 2003, analogous to the Movement of Homeless Rural Workers (MST), but which acts in urban areas. Today there are approximately 80 thousand members. The movement basically maps abandoned properties in the downtown area and systematically occupies them. Besides FLM there are some other autonomous partnering groups who work in the same way such as MTST – Homeless Workers Movement and MSTC – The Homeless of the Center Movement. The vast majority of these movements comprise of people who work down town but have been pushed away to the peripheral areas of the city. Differing from European squats, which are formed mainly by the artistic community and by people who purposely put themselves in the margin of the capitalist system, Brazilian squats are formed by families of low-income workers, and also by immigrants who want to establish themselves in the country. 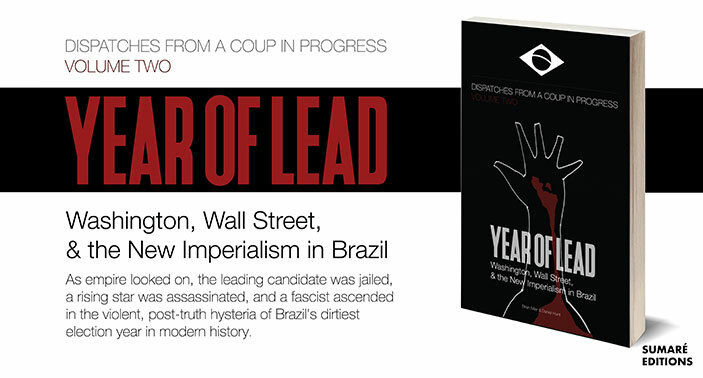 Today there are over 60 buildings occupied, in the central region of São Paulo alone. 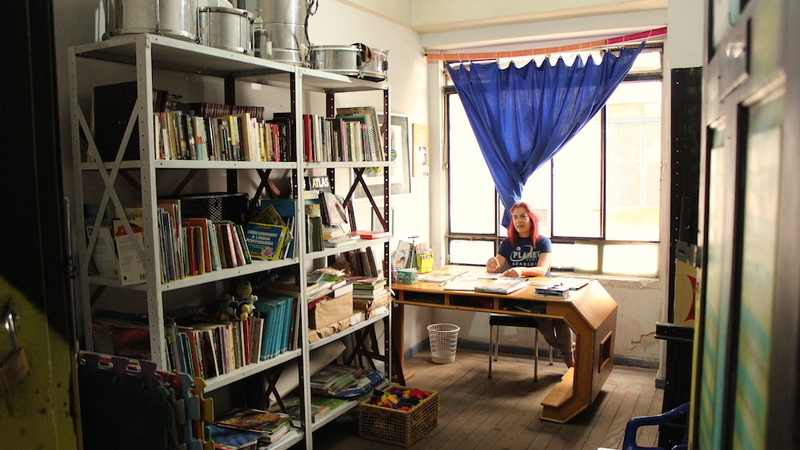 Nazaré Brazil, one of Squat Hotel Columbia Palace’s resident, at its library room. A few years ago I helped build cultural centers in some of the occupations in the downtown area. At that time I was aware that a new building would be occupied, and volunteered to be part of the group that first entered the building. The first 48 hours are crucial: it is when occupants are most vulnerable, because the police can enter the building if they obtain authorization from the owner to do so. After two days of occupation occupants can only be evicted under a court mandate, which occurs if the owner appeals to court with a request for repossession of the property, this is often a lengthy a complex process. The night when we went to occupy the building, it seemed that no one knew exactly where they were going or what the history of the place was. In single file, we ran down a dark downtown alley, some people broke down a door and it was only when I was already inside that I realised that it was not my first time I had entered this building. A few months before, I collaborated with some artists from New York who were staying at the spot we occupied that night. The building, which is owned by an art collector, served to house art and sporadic artist residencies. 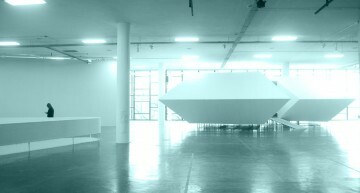 But most of the time was kept empty. I could not help thinking of the irony and strength of that moment. It was a direct and efficient response to the effects of gentrification. The ‘Right to the City’ concept that was developed in the book “Le droit à la ville” published in 1968 by the French philosopher Henri Lefebvre, is in fact a part of the Brazilian law guides. The housing movements are enforcing the law. And they are very careful in doing so. A few hours after entering the building, the movement’s leaders (yes there is a clear hierarchy within the movement, another difference between these and the European squats) soon organized to collect all the small objects found within the old hotel, and lock them up in a room to make sure no one would take ownership of unrelated objects. In general you can not enter the occupation after 11 pm and alcoholic beverages are prohibited. There are several rules that besides trying to guarantee a good relationship between neighbors, legally protect the act of occupying and their supporters. In addition to quickly “resolve” the issue of having a place to live, the housing movements wants to pressure public bodies, about creating an efficient program for affordable housing. 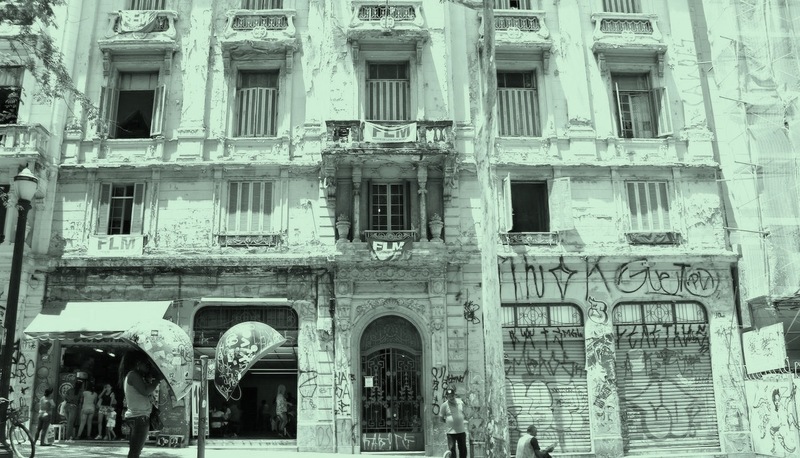 The city mayor Fernando Haddad indeed listened to their claim, and in October of this year put into effect a progressive Property Tax amendment, (Emenda do IPTU Progressivo) which aims to transform abandoned buildings of the city center into affordable housing. Here is how it works: the owners of properties that have more than 60% of its area without function will be notified by the city. If within a year the property still has no social function, the tax levied on the property begins to gradually increase until by the seventh year of abandonment, the property passes to a cost 20% of its gross value in taxes, and can finally be bought by the city to be transformed into housing. “In the broad area of São João avenue where the plan aims to repopulate, there are located 24 of the 78 properties that will be reported in the first wave, there are certainly empty buildings which are not fulfilling their mission. Unhappy owners can attempt to fight in court. From their perspective, even if they may be using their properties in such a way that has an adverse effect on the city, the expectation of future profits -or what is called “speculation” – is what matters “ explains the urban planner Raquel Rolnik on her blog. They will have to wait and see how the law is enforced, but they will not wait seated. Currently the center of Sao Paulo is not exactly an ‘enjoyable’ area. With virtually no public places to hang out, and a total absence of squares or wooded areas, it is difficult to use the city as a place to exchange experiences. There are some policies that are trying to change that, for example, encouraging the construction of Parklets – living areas that occupy the place of one or two car spaces, but it turns out that living in public spaces is not part of the culture or lives of the residents of the center. For around 5 years now, some collectives such as Voodoohop, Parque Augusta and Anhangabahoots have been encouraging temporary occupations, parties in public spaces and inside squats. 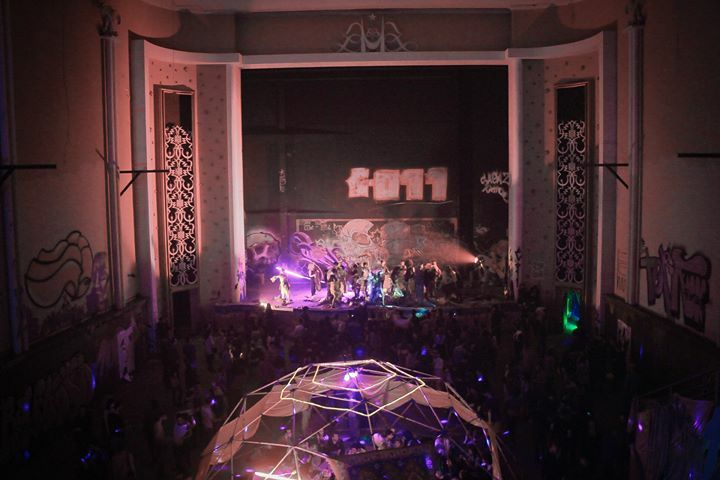 These parties have attracted many people, bringing attention to abandoned parks or previously unknown places. With that, people are starting to feel like the city is theirs, and maybe even feel responsible for it. Parque Augusta movement hanging out outside a recently closed park, downtown. “We are reactivating this spontaneous potential to occupy the city. The party as a meeting of all the arts, of living experience, not as a repetition of a formula ” says Laura Diaz, producer of Mamba Negra, an offshoot party from the Voodoohop collective, which usually happens within popular squats. From this new demand that the city is creating, private initiatives are filling the gap left by the city management, such as the Citybikes in São Paulo which are run by corporations. And these brands are aimed at the potential customers of the middle-class audience, again marginalizing the other residents. The observation of such a paradoxical movement is developed by professor of sociology Sharon Zukin in the book ‘Naked Cities’ that brings up the concept of authenticity, originally used by Shakespeare and Rousseau for individuals who were able to understand and satisfy their passions and inner desires. Zukin shows that contemporary society transferred the concept to physical spaces or objects and people from the creative class tend to look for “authentic neighborhoods” to live in and hang out and treat authenticity as an characteristic of a product. She points out that it is important to “inhabit a place, not just consume it as an experience“. So people that are organizing those occupations in the city are experiencing these kind of issues, how to be an itinerant movement, present the possibility of resumption of the city as a spontaneous meeting point, without consuming the place as a product and without starting a gentrifying movement that eventually harasses the residents of their own neighborhoods? “We need to take advantage of the loopholes of private initiatives to make it normal in our culture, to the point where people will no longer accept to live in a city where they cannot be really free to have fun in, and to challenge the authorities for it“expects Pita. These issues are quite complex and we can not be sure of the consequences of our choices. To be open to meetings and to know where one is and what is going on in that place, is the untransferable responsibility of each of us. Cities are constantly changing, and we can all be agents of change in what we wish to happen. 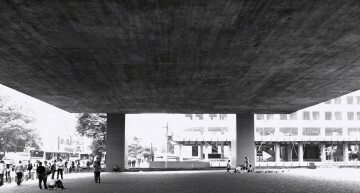 Attitudes like these movements struggling for housing and temporary occupation of the city are helping to turn São Paulo into a more “livable” city, almost pleasant, and also pressing the government to take public policy attitudes. And this has also begun to be noticed by the authorities: after about four years of making free parties in the centre, completely autonomously, since 2013, Voodoohop began a partnership with the city government to produce SP NA RUA (Video), a festival that happens over one night, and brings together over 15 party collectives, to provide a completely open and free festival in the streets of the old city. When people show themselves it gets harder to ignore them. 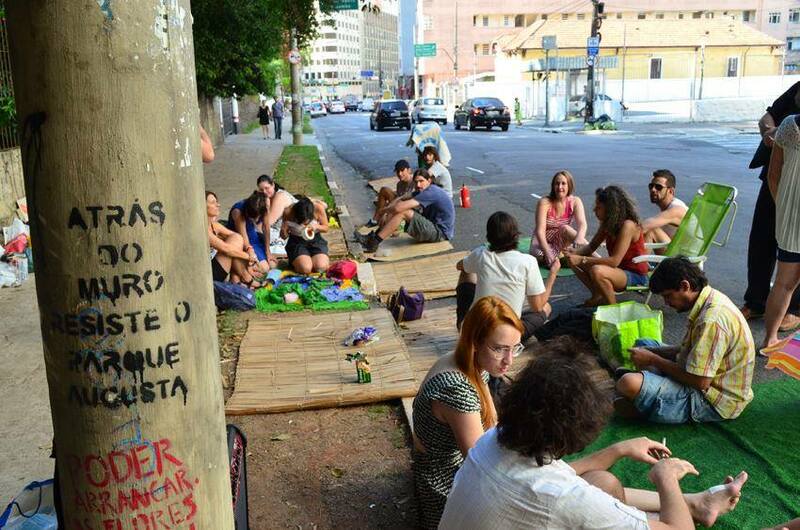 São Paulo has a clear message: if rents are expensive, we occupy abandoned buildings, if we do not have parks, we picnic on the asphalt. 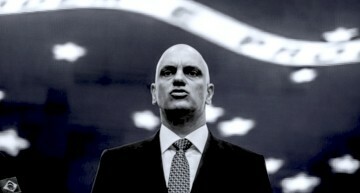 São Paulo based Brazilian writer. Science & Civil Disobedience Enthusiast.